After sampling Apple CarPlay on a number of cars recently, my advice to car companies is to simplify the head unit you are fitting as standard equipment, and just make sure it's compatible with, and offers, Apple CarPlay. In fact I think it should be the default choice. 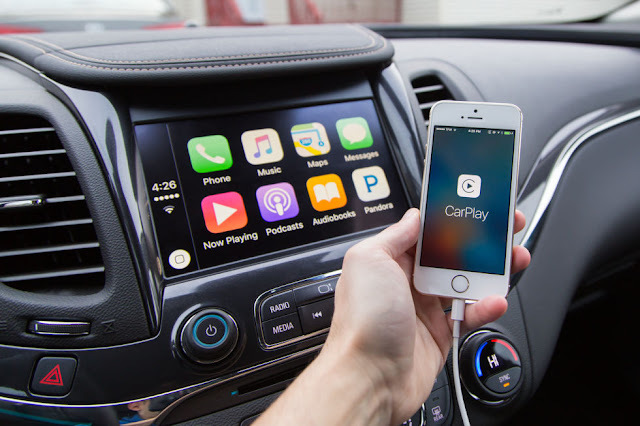 For those in a parallel universe there is also Android Auto, however as I am a happy member of the Apple ecosystem, I’m happy to plug the Apple system. Using it is simplicity itself. Plug in your compatible iPhone, engage CarPlay and the display acts as a 'mirror' for everything on your iPhone, including maps, which means you don’t need a GPS SatNav option on the head unit. I was a reluctant user of Siri, but in the car it makes perfect sense. “Who do you want to call?” Speak the name under which that contact is listed in your Contacts List, and, voila, Siri dials the number and you’re connected. Siri will also read your messages to you, and take replies. Groovy. Likewise playing music from your library. Select any of the options: Album, Artist, Playlists, and you’re rockin’. I think Apple CarPlay and Android Auto could be major contributors to safer driving, that is until using the features of mobile phones is outlawed completely.